With 88 minutes to solve his own murder, Al Pacino stars as Dr. Jack Gramm, a college professor who ten-years ago was the expert witness that helped send serial killer Jon Forster (Neal McDonough) to Death Row. While leaving the court room, Jon Forster, the Seattle Slayer looked into the eyes of Gramm and whispered his revenge. From here the movie unfortunately becomes a clichéd thriller as ten years after the court case, Gramm receives a phone call that matches the threat he heard those many years ago. From here, a game of cat and mouse begins as Gramm attempts to solve this crime before he is the next victim. 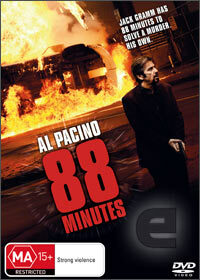 Even though 88 minutes stars a star studded cast that includes Alicia Wiit, Leelee Sobieski and of course the Godfather himself Al Pacino, director Jon Avnet fails to link this story together successfully that at times seems like a Greek tragedy and fails to create a truly thrilling experience. Even Pacino cannot turn 88 Minutes around in what at the end of the day is an unfortunately predictable thriller that is not bad, nor is it truly good. Definitely a movie when there's not too much available which is a shame.